Not to be confused with Sault Ste. Marie International Bridge. The Railroad Bridge runs parallel to the highway bridge, and is the bridge on the left in the image. Sault Ste. Marie Bridge Company is a subsidiary of the Wisconsin Central Ltd. 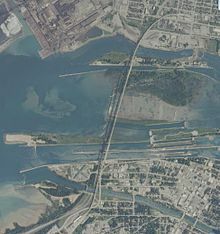 It operates a railroad bridge over the St. Marys River between Sault Ste. Marie, Michigan and Sault Ste. Marie, Ontario. Shot of the rail bridge in 1905, showing the 10 original Warren truss spans. The highway bridge has not yet been built. The swing bridge portion is shown, retracted to allow the passage of ships in the canal. The other bridge is the highway bridge for vehicle traffic. ^ "Sault Ste. Marie Bridge Company" (PDF). Employer Status Determination. Retrieved 23 April 2010. This page was last edited on 3 March 2018, at 18:19 (UTC).